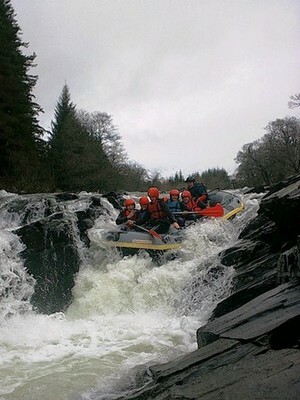 White-Water-Rafting and River Bugging in Scotland! White Water Rafting and River Bugging - Scotland Style! White Water Rafting - Scotland! The rivers are in Scotland are so inviting..it's hard to resist the urge to wade in..swim, skip stones..or just to stay out of them really..
Of course there are many more, but the Rivers Tay, Tummel (just north of Pitlochry) in Perthshire and the Findhorn, near Inverness, which empties in the Moray Firth, are all popular white water rafting rivers. White water rafting is an extremely exciting sport, and like any extreme sport, it can be dangerous. With proper instructions however, and the right equipment and guide, it can also be wonderfully exhilarating. All you need to do to keep yourself safe is to choose your appropriate level. (See details of levels at the bottom of this page). 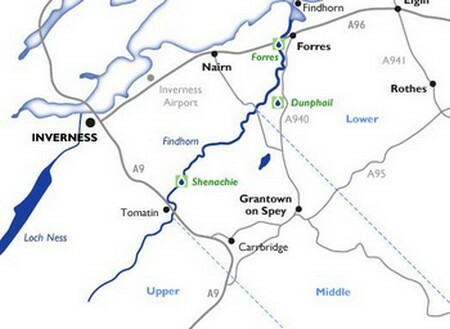 Many companies in Scotland are out there and available to help you find the best location, take you to the river, and instruct you in the sport of white water rafting. In addition these companies will provide everything you need for the best experience possible, from transportation to and from the site, wet-suits and paddling techniques, to accommodation for longer expeditions. And you won't want to leave! All you need to bring is your swimsuit, a towel, and your sense of adventure. You can go for the day or the week, or even a few hours of unmitigated pleasure, and children as young as eight can be permitted to go along, depending on the level of skill needed to navigate the river and the prevailing conditions..
For those of you who are experienced white water rafters, Scotland is one of the best destinations in Europe for your rafting expedition. Weighing only about 7 kilos, with a bit of training they can be easy to maneuver around, and give you the flexibility to pirhouette through the water. The extra cushioning pads you against collisions and altogether the experience can be compared to a thrilling sort of water bound dodgem ride..
Two companies who provide the river bugging experience are Extreme Dreams and Nae Limits. 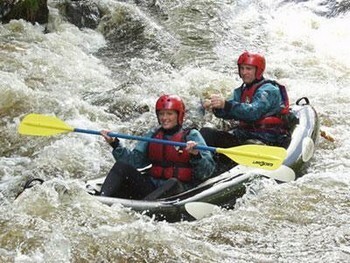 Splash White Water Rafting provides white water rafting trips on the River Tummel, just north of Pitlochry from the beginning of June through September, although there are folks out there who go white water rafting in the winter...brrr...! This river has the largest recorded flow of water in the UK. When "classes" are mentioned, I have provided a definition for each one, not to scare you, but if someone tells you the expedition needs Class 6 skills, at least you will know! Class 6: Class 6 rapids are considered to be so dangerous as to be effectively unnavigable on a reliably safe basis. Rafters can expect to encounter substantial whitewater, huge waves, huge rocks and hazards, and/or substantial drops that will impart severe impacts beyond the structural capacities and impact ratings of most all rafting equipment. Traversing a Class 6 rapid has a dramatically increased likelihood of ending in serious injury or death compared to lesser classes. Choose the company, choose the river and then have the time of your life..
You've read the rules, now here's some web addresses to get started!